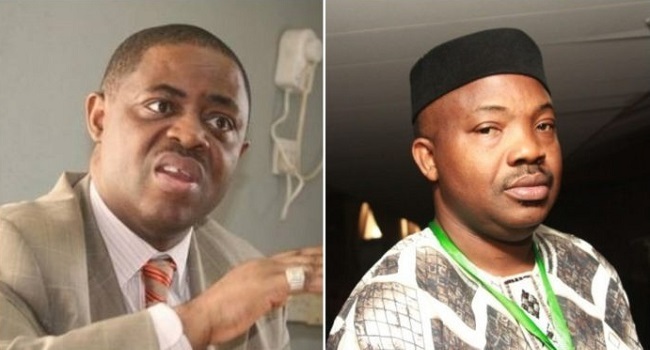 Former Minister of Aviation, Femi Fani-Kayode, and the Afenifere spokesman, Yinka Odumakin, have dragged the Economic and Financial Crimes Commission (EFCC), to court over threats to arrest them for allegedly spreading fake news. Also dragged to court along the EFCC by the duo are the Department of State Security (DSS) and the Nigeria Police Force. In the suit filed on their behalf by Chukwuma-Chukwu Ume (SAN) before the Abuja Federal High Court, they asked the court to restrain the DSS from detaining them and also that N20 million be paid to them as damages for the unlawful threat to arrest them. Fani-Kayode and Odumakin had raised the alarms that the EFCC had surrounded the home of the Chief Justice of Nigeria, Justice Walter Onnoghen, who is facing prosecution for alleged corruption. Their alarms however turned out to be false; a development that made the EFCC vow on Wednesday to invite them to explain the reason for spreading such news that turned out to be fake. EFCC had supposedly claimed that the duo might not be released if arrested except they justify their actions. But on Thursday, Fani-Kayode and Odumakin quickly instituted court action marked FHC/ABJ/CS/49/2019 before a Federal High Court sitting in Abuja. In the originating summons, the plaintiffs praying the court to rule that the respondents’ public declaration to arrest them on the basis of spreading false rumours is an infringement on their fundamental rights as enshrined in Section 34(a) 35(1) (4) and (5) of the 1999 Constitution.